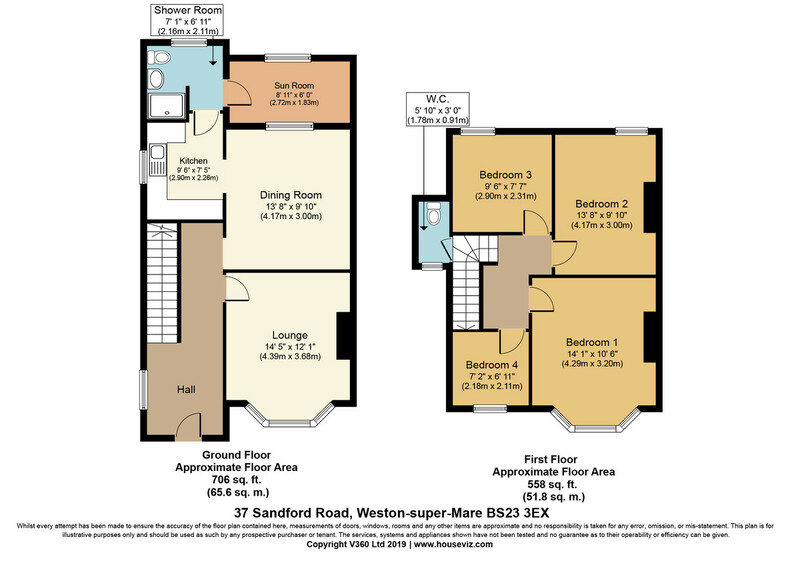 SHORT LEVEL WALK TO TOWN & SEA FRONT - 4 Beds, 2 Receptions, Kitchen, Refitted Shower Room, Cloakroom, DG Sun Room, Front & Encl. Rear Gardens, Gas CH, UPVC Double Glazing Occupying a pleasant position affording excellent access to all local facilities and bus routes, we strongly advise an internal inspection to fully appreciate this beautifully appointed Semi-Detached property. The accommodation briefly comprises 4 bedrooms, 2 reception rooms, fitted kitchen and shower room, cottage-style garden to the rear. The property in our opinion can be found in 'show home' condition, is an ideal First Time Purchase offering a delightfully presented and spacious family home. ENTRANCE 18' 4" x 5' 2" (5.59m x 1.57m) Stairs rising to first floor, dado rail, radiator, double glazed window to side, telephone point, attractive flooring, access to all principal rooms. LOUNGE 14' 1" x 12' 0" (4.29m x 3.66m) Double glazed bay window to front, feature open fireplace with brickwork surround and display shelves either side, coved ceiling, radiator, TV point, telephone point. SHOWER ROOM Recently re-appointed and comprising walk-in double shower cubicle, pedestal wash hand basin, close coupled WC, inset ceiling spotlights, attractive flooring, heated towel rail, airing cupboard, obscure double glazed window to rear. REAR LOBBY 8' 11" x 6' 0" (2.72m x 1.83m) With power, double glazed window and door providing access to rear garden. CLOAKROOM 5' 10" x 3' 0" (1.78m x 0.91m) Close coupled WC, radiator, obscure double glazed window to front. 1ST FLOOR LANDING 7' 11" x 6' 9" (2.41m x 2.06m) Access to roof area. BEDROOM 1 14' 2" x 9' 6" (4.32m x 2.9m) Double glazed bay window to front, radiator, exposed floorboards. BEDROOM 2 13' 8" x 8' 10" (4.17m x 2.69m) Double glazed window to rear, radiator, exposed floorboards. BEDROOM 3 9' 8" x 7' 5" (2.95m x 2.26m) Double glazed window to rear, radiator. BEDROOM 4 7' 11" x 6' 10" (2.41m x 2.08m) Double glazed window to front, radiator. OUTSIDE The property enjoys a small front garden enclosed by brick walling. There is a pathway between the properties with gated access leading to the rear garden.